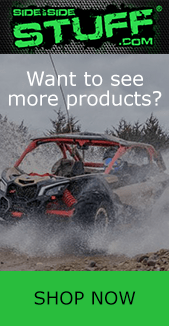 We’ve had quite a variety of videos last month, from muddin’ to sand slingin’ and everything in between; we even had some UTV racing action to post. We don’t mind when our own videos make the Top 10 either, a couple clips from our last trip to St. Joe State Park in Park Hills, Missouri for Rally at the Mines. If you’d like to see your SxS video clip featured on our Instagram page, be sure to send it to us via Direct Message; it very well could end up right here on our Top 10. Alright guys, here’s our Top 10 Instagram Video Clips from the month of April. Bert’s Fab and Design had one cool custom Polaris RZR at Rally at the Mines. Click HERE to see more from Rally at the Mines 2018. Take a ride with @hiredgunsracing!! – When you can smell blood🦈………. Abel springs is this weekend for round #3 of the torn series! Here’s another clip from Rally at the Mines, this was such a blast. Click HERE to read our event recap from Rally at the Mines 2018. STUFF fan Hired Guns Racing competed in the UTV race at Mud Nationals in Jacksonville, TX, click HERE for more from Mud Nats 2018.